“I’m thankful for the trees,” my five year old blurted out last Thanksgiving, as we were going around the table giving thanks for the usual holiday stuff (togetherness, food, health, etc.). His comment was so unexpected that I’ll admit we all burst out laughing (being a child must feel like a thankless job at times). But for all its randomness, I believe his comment was 100% genuine. JP has always had a special place in his heart for trees (plus his favorite color has been green since he could talk—see last year’s post in honor of Earth Day). I like to think that a tiny bit of his appreciation for these living, breathing, magnificent things, which line our streets and fill our forests, is owing to me. You see, as much as I want my children to grow up with the deepest love and appreciation for their planet, as much as I believe that the future of this planet lies heavily in the choices their generation will make, I can be lazy. I would like to be the kind of mom that plants a vegetable garden every summer with her children, that participates in volunteer days picking up litter at inner-city parks, that turns banana peels into compost…instead, my kids get a single tomato plant and some herbs in planters on our deck. But trees, now trees are something I can get behind, something that requires very little effort on my part. So, in our family, we talk a lot about trees. We observe their transformations as we drive to school or scooter around the neighborhood. We mourn the loss of trees that have to be taken down and save mementos to display in our backyard. We lie on the grass and look at the sky through their just-budding branches. We pick up their leaves, their acorns, their helicopters. We work hard to remember their names (I am terrible at this, but fortunately, Santa gave JP a fantastic field guide for identifying trees). And we read books about trees—facts and poems and stories—especially in the spring, when our amazement is at its peak. With a single, open-ended phrase on each page, this book begs for interaction. I recently read it to my son’s preschool class and was delighted at how quickly the children picked up on these unexpected metaphors. On one page, the text says simply, “a game of dress up,” with the illustration of four bare-branched trees silhouetted against a blue sky. “That tree looks like it has on a white hat—or a wig!” one of JP’s classmates called out about one of the trees with a white puffy cloud behind it. “That tree is wearing birds in her hair, like bird clips!” ventured another. Last week, for the second year in a row, my family picnicked beneath the cherry blossoms that line the Tidal Basin in downtown DC. In the filtered light of dusk, a warm breeze picked up and hundreds of tiny white blossoms began to float down on us. 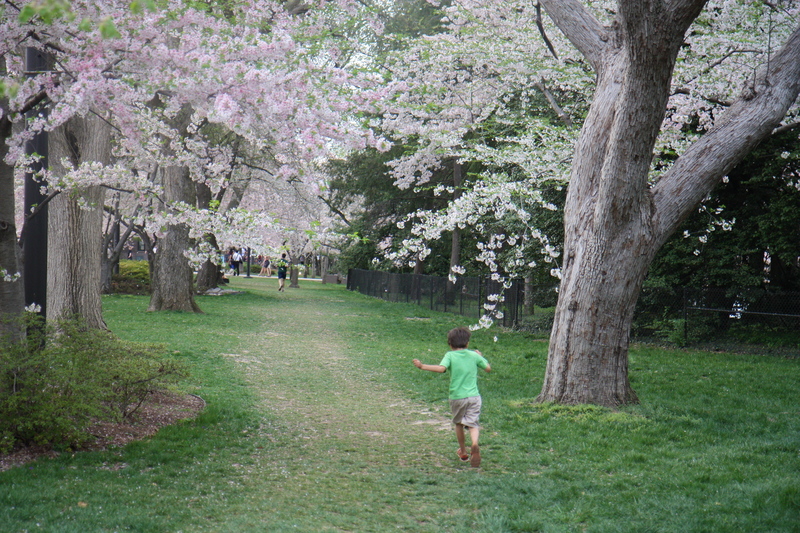 “It’s a blossom storm!” my son cried. To me, it seemed positively magical, like the enchanted forest of a fairy tale. But then I had to remind myself that this was no fairy tale. This was 100% real. I, too, am thankful for the trees. You are currently reading Beholding the Trees at What to Read to Your Kids.